Don't worry … you’ve found Wolverhampton and West Staffordshire's number one domestic oven cleaning service! OVENGLEAMERS has been providing superior oven cleaning services across the UK for more than 14 years. 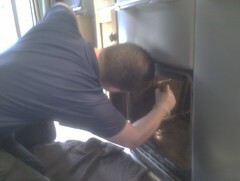 Our professional oven cleaners are Fast, Safe and Thorough. They are professionally trained and insured. I have an oven that now looks like new. John arrived on time and turned the mess that was lurking in the kitchen into something I can now be proud of. I am really impressed with the service given and have saved the number so that the oven can never get that bad again.